Conteibuting to the completion of Tower capital Gate which consists of 35 storeys, which is the tallest tower italic the world and the cost is 231$ million dollars. Contributing to establishment of zayed University in the city of Abu Dhabi, capacity of 6000 students at a cost of 818$ million dollars. 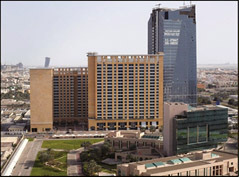 Contributing to the establishment of a complex in Abu Dhabi, which includes a 40-story hotel and commercial building and housing at a cost of 330$ million dollars.